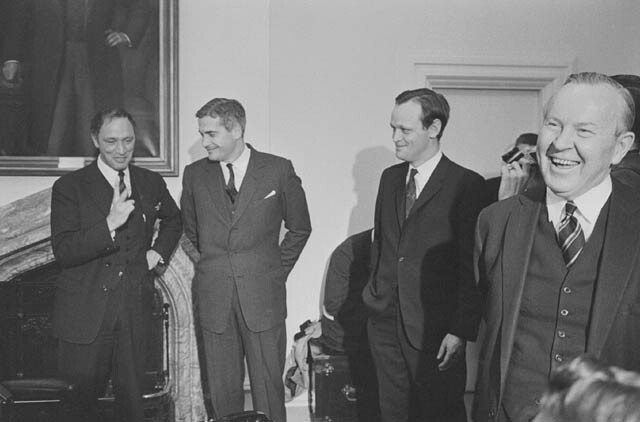 Figure 9.33 Pearson (at right) collected in one cabinet three future PMs: Trudeau, Turner, and Chrétien, April 1967. It is one of the remarkable features of Canadian political history that Lester B. Pearson is in some respects better regarded and more widely recognized than Diefenbaker. He never won a majority government, he was at least as much a compromiser as Mackenzie King, he did not stand up to the Americans, nor did he bring good continental relations in his wake. Pearson does, however, have that Nobel Prize going for him, and it was under his one term in office that many of the trappings of modern Canadian nationalism took form. Pearson came to politics from a career in diplomacy. He joined the newly established Department of External Affairs in 1927 and was subsequently posted to London for much of the World War II. His next posting was the plum job of Canadian Ambassador to the United States. He was elected federally in 1948 and spent the next nine years as Secretary of State for External Affairs. He had a hand in the establishment of the United Nations and NATO. He was, of course,a key figure in resolving the Suez Canal Crisis of 1956, and successfully proposed to the UN the idea of a peacekeeping force that could be deployed with sufficient authority and firepower that it might keep warring sides at bay while diplomats sought a resolution outside of conflict. The Nobel Prize came to him in 1957, just as St. Laurent’s government was about to collapse under the first Diefenbaker victory. By 1962 domestic issues were competing with international affairs for the voters’ attention. The Cold War was at its height, and some Canadians were drawn to a new Liberal Party leader who had a gold-plated resume in diplomacy. Of course, many voters simply voted against the incumbent regime. Pearson’s first administration, however, was not marked by a resounding victory at the polls. The Liberals did well in Quebec, but they were not yet restored to dominance there; indeed, the Social Credit (Socred) Party won enough seats to form a balance of power in the Commons. It was worse elsewhere in the country. In point of fact, Pearson’s government was elected almost entirely from central Canada. Initially with the support of the Socreds, and then with the New Democratic Party (NDP), Pearson was able to hold his minority together until another election in 1965. Thereafter, he had to coax another minority administration along to 1968. Pearson campaigned in 1962 on the promise of “60 Days of Decision,” a swipe at the Diefenbaker government’s inability to move forward on several key issues. Pearson quickly accepted the nuclear warheads for Bomarc missiles, rushed into place universal health care under the Medical Care Act (1966), and introduced the Canada Pension Plan (CPP). Pro-labour policies (including a minimum wage and mandatory vacation time) won support from union elements in the NDP. Canada Student Loans were another product of the Pearson administrations. Pearson demonstrated solid diplomatic ability when it came to making a minority government function well, but he did less well against the Americans. As the United States’ involvement in the Vietnam War increased, Washington requested that Canada commit troops, as it had to in Korea from 1949 to 1957. The issue, from Washington’s perspective, was largely the same: containment of communism. Pearson, however, resisted and sought to present Canada as a non-belligerent ally of the United States. Canadian firms profited heavily from the war as they supplied necessary materiel to the United States, including the controversial defoliant Agent Orange. Pearson did nothing to impede this trade but did speak out against the American campaign. On 2 April 1965, speaking as a guest at Philadelphia’s Temple University, Pearson endorsed the idea of a cessation in the United States’ bombing of North Vietnam so that talks might get underway between the two sides. President Lyndon B. Johnson (1908-1973) was outraged that a foreign leader would criticize his war policy, even more so because Pearson made his comments while visiting the United States. The Prime Minister was summoned to the White House where Johnson — a significantly larger man than Pearson — picked him up by the lapels and thundered, “You pissed on my rug!” After nearly an hour of being dressed down, Pearson was permitted to leave and subsequently issued an apology. Figure 9.34 Close, but not the winner: the Pearson Pennant, ca. 1964. If St. Laurent’s nationalism contained elements of Henri Bourassa’s continentalism mixed with a global vision, and Dief’s was simultaneously anti-American and somewhat pro-British, Pearson’s drew on old Imperialist dreams of Canada as a leader on the world stage while disavowing both British and American orientations. Pearson contributed to the dialogue on Canadian identity in several important, if highly symbolic ways. First, and probably most notably, he was responsible for initiating the Flag Debate, out of which came the successor to the Red Ensign, the Maple Leaf flag. 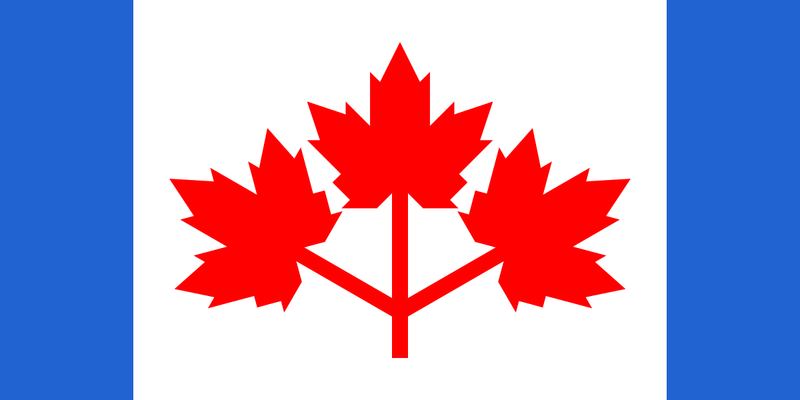 Although his preferred version — two blue borders on a white centre with three red maple leaves — failed to get support (it was mocked as the “Pearson Pennant”), the now-familiar red-and-white flag emerged as the consensus favourite among those who supported the idea of a new flag at all; many did not. Diefenbaker, pro-British elements, and veterans’ groups in particular remained hostile for many years thereafter. (They were, if possible, even less happy about “O Canada” replacing “God Save the Queen” as the national anthem in 1965.) If the new flag spoke to Pearson’s view that Canada was autonomous and ought to look the part, his Royal Commission on Bilingualism and Biculturalism, launched in 1963, was an effort to have a conversation that Canadians had mostly avoided for the better part of a century. The Bi and Bi Commission would report out after Pearson was gone from office, but its timing, along with that of the Centennial celebrations in 1967 (including Expo ’67), would contribute to Pearson’s legacy as a maker of a burnished Canadian nationalism. Watch this Canada Starts To Produce New Flag video to see Pearson defending the Maple Leaf flag in front of a largely hostile crowd of Legionnaires. Watch this video on Diefenbaker’s Flag Crusade to see Diefenbaker’s reply. Pearson’s contribution to Canada’s role in international affairs is better known than his contribution to the growing welfare state and, particularly, the introduction of universal health care and the Canada Pension Plan. Despite being ostensibly better disposed toward the United States than Diefenbaker, Pearson found himself roundly criticized by American President Johnson. Pearson’s introduction of a new flag was an element in a larger attempt to develop an independent and singular identity for Canada at mid-century. Pierre Elliott Trudeau, John Turner, Jean Chrétien et le premier ministre Lester B. Pearson après un remaniement ministériel (Online MIKAN no.3623031) by Duncan Cameron / Library and Archives Canada / PA-117107 has nil restrictions on use. Canada Pearson Pennant 1964 by Zscout370 is in the public domain. 9.7 The Pearson Interlude by John Douglas Belshaw is licensed under a Creative Commons Attribution 4.0 International License, except where otherwise noted.